This is my first tank. It is a Fluval Flex 9. I have a plan to make sure no shrimp get into the filter compartment I think will work - knitting mesh on the wall, large pore sponge filling up the intake chamber. I am also planning to keep the water level about an inch below the top of the wall leading to the compartment. As for flow, the current version seems to have a pretty docile pump doing something like 60 gph, and it's not exactly wreaking havoc on my plants, so I'm hoping it'll be fine. I've included a picture of the current setup. PLANTS: By the time I have shrimp, I expect the surface to be about 75% covered with salvinia and dwarf water lettuce, which are growing quite quickly. On the ground I have some Marimo moss balls, crypt parva, microsword, and Monte Carlo. They are all doing fine and I am not expecting rapid growth. Everything is stable after initial die off of the plants. I am not planning to use ferts, as several of the suppliers I contacted suggested that shrimp did better in un-dosed tanks. Should I add or remove anything? STONE: that's Ohko Stone in my tank. The gravel is Seachem Flourite. WATER: at the moment, it'll be tap water, but my cycle seems to have really messed with my parameters. Out of the tap, I'm seeing pH 7.4, Gh 7, Kh 3, but I have seen all of those stats take a nose dive over the last few weeks as I cycled the tank. That's one of the big questions I have to get answered before adding shrimp. I am debating RO, but would like to run with tap. I have a 29 gallon that has been quite stable, albeit with fish only. We'll see if, now that I have cycled the tank, I can get things stable in 8 gallons of water. No heater. House is routinely at 70 degrees and the tank is literally 10 feet from the thermostat. Your advice will be appreciated. Here's my pic. ﻿knitting m﻿esh on the wall, large pore sponge filling up the intake chamber. Yeah that sounds like it might work. Using sponge to block the intake holes should be enough. Whatever you use, make sure it is easily removed during tank maintenance days, so you can clean it. Pulling a sponge insert out and swishing it around in water to clean it is the easiest. Minimise your chores, so you have more time watching the shrimp. That's fine. It's not your plants you need to worry about. Worry about the likes/needs of the shrimp first. Shrimp prefer a slower flow. Correct. The ferts themselves do not kill shrimp, but ferts change the water parameters. And the constant change can upset the shrimps health. Should I add or remove anything? STONE: that's Ohko Stone in my tank. Stones can change water parameters - KH increases and thus pH also increases. If you find your KH and pH rising and you need to battle it rising then look at removing the stones. The gravel is Seachem Flourite. Flourite is an ok substrate for Neo Caridina. Hopefully Neos were on your plans for this tank. That's normal for a cycling tank. As the bacteria convert Ammonia to Nitrites and then to Nitrates, they cause pH, KH and GH to drop. This is fine while the tank is still cycling. Keep your pH above 7 using tap water (dechlorinated). You can reduce pH, GH and KH after the tank has cycled to match the shrimp's requirements just before adding them. Fish are a different ball game. Be prepared to re-learn all new things when keeping shrimp. I bet you never needed to worry about TDS with fish. So a tip from me is to buy a TDS meter. You can get a cheap one for now (Amazon or EBay). It won't be super accurate, but that doesn't matter. You just need it to be consistent, even if it is consistently reading 10ppm off. Knowing your TDS (Total Dissolved Solids) in the tank is very helpful to keeping healthy shrimp, and the TDS meter can be used to improve your water quality for the fish tank too. RO is undoubtedly better because you are in control of what is in the water. But of course there is an initial cost of purchasing the unit. Check out the Water Parameter subforum and read topics on RO water. Weigh up the benefits vs the cost and then maybe you can make a decision. (RO water is much better than tap) Even Rain water is many times better than tap water. Not the best idea when the tank is cycling. Heater is required at this stage of the tank's setup for bacteria growth. Think about it ... do bacteria grow faster in a warm wet environment or a cold environment? - Crank the heat up to 28degC. unless you have lots of time to waiting around for bacteria to grow in the cold. Remove one of these and they don't grow or die completely. Tap water can provide pH 7 & up water with some ammonia in it, so all you need is to provide water that is circulating and heat. If you squeeze the gunk from your fish tank's filter into this new tank, you will seed it with millions of beneficial bacteria, thereby reducing the cycling time drastically. That's how I cycle a new tank. I use tap water initially, squeeze in the gunk from another filter (from a known healthy tank), turn the heat up and wait. After the tank is cycled, I empty 99% of the tanks water and add RO water adjusted to the parameters of whatever shrimp I am keeping. Thank you, JayC. I'll get a TDS pen and watch the stones. We'll have to see how the flow works for the shrimp. I can't predict it. I am definitely planning on Neocaridina. By the way, I did have a heater in the tank while I cycled it. I have removed it now. The bacteria will have to survive in 70 degree water. Based on the consumption of 2ppm of ammonia and near complete (to .25 ppm) consumption of nitrites in 12 hours, I suspect they survived the decrease in temperature. So, after making sure all the ammonia was processed today, I did a big, like until the siphon failed, water change. Here are my water specs, tap water that I treated with Prime and left sitting for 24 hours, now in the tank. I don't have a TDS pen yet, but ordered one and should have it tomorrow afternoon. Also, we'll see if these hold, as the first three have been dropping while I cycled. Time to put a little ammonia in the tank so my bacteria has something to eat. Back to check again tomorrow. Ammonia dose = 1ppm. If I can keep it stable, I will likely attempt to use tap water. If not, it's RO and either Salty Shrimp or Dennerle Shrimp Salt for me. That is one beautiful blue shrimp. I hope they all arrive alive and well and you get lots of enjoyment from them. I noticed there is a difference in your water parameters from the first post and the last post (only 4 days apart) as you are using tap water. I think you should be fine with neo caridina in tap water (mine are, and my tap water has the same instability issue, not as drastic though) but you should probably be aware of the issue with tap water. When doing water changes do a slow drip etc and not too large water changes, has worked for me for 5 years anyway. It probably isn't worth going the RO water remineralised unless you have a problem as it is a lot more fiddly and neos should be ok with tap water, and yours looks to be close enough. You may need to get some RO (or similar bottled) water for top up though IF you get a lot of evaporation between water changes, but that is something for the future when you have had it running a while? The original photo looked great, it is a shame that you removed that lovely beautiful rock. Hope the shrimp are as wonderful in colour as the above, good luck! Thanks, Simon. I didn't remove the rock, but I am keeping an eye on it. It's kind of the center of tank, so it'll be a shame if I have to. The water parameters in the first post were straight out of the tap. In the second, they were in the tank. That, plus my pathetic skills in measuring, probably account for some of the difference. We'll see. My plan is to do 10% water changes weekly (maybe a bit more frequently if I see parameters changing). Based on my last big water change, it looks like the amount of water in my tank is about 6 gallons plus whatever is in the gravel, so dripping should not be a problem. I hadn't thought of doing water changes that way. Stats this morning. Gh holding at 5 (well, 4-5, 5th drop). Kh holding at 2 (1-2, 2nd drop). pH is 6.6 (it is dark, though, and I will probably also take a reading when the lights are on to see the fluctuation). That seems like a pretty big drop in pH to me overnight, but it is what I have seen throughout the cycling process, and when I measured, except for one oddly low reading of like 6, the pH held at that. We'll see. I'm using this thread as a sort of tank journal to keep these numbers. Hoping the TDS numbers give me some insight. Today, getting TDS pen, going to get the knitting mesh (hobby store - 4.5"x12" is the size for the Flex 9's intake chamber), and then hopefully finding some foam to fit too, also 4.5"x12"x2.25" (probably some bigger foam I can cut to size). That should keep the shrimp in the main tank instead of in the filter chambers. And sorry to hear you bought from AA.... expect to get shrimp with "green fungus" aka "ellobiopsidae" aka "algae". If they simply die off with no explanation, then it's because they are imports. AA does not have a good reputation with shrimp.... but their customer service is great. If they survive, then great! Pleased to read you have kept the rock in he tank, I saw JayC was warninng that rock MAY alter the parameters but I think I would have left it in situ and kept an eye on it as you have, and I think that was what JayC was intimating as well. I do about 15% water change each week (I have fish as well in the tank) and always drip new water into the tank, one advantage to dripping is that you don't need to bother whether the 2 waters are the same temperature either. Hope the shrimps are ok and better than zoidbuerg says, that would be devastating. You can easily increase the GH and KH using the shrimp products but will use a lot less than if you were using RO water! TDS pen is the one I use almost every day as it is soooo easy to use so worth getting one as they are cheap! 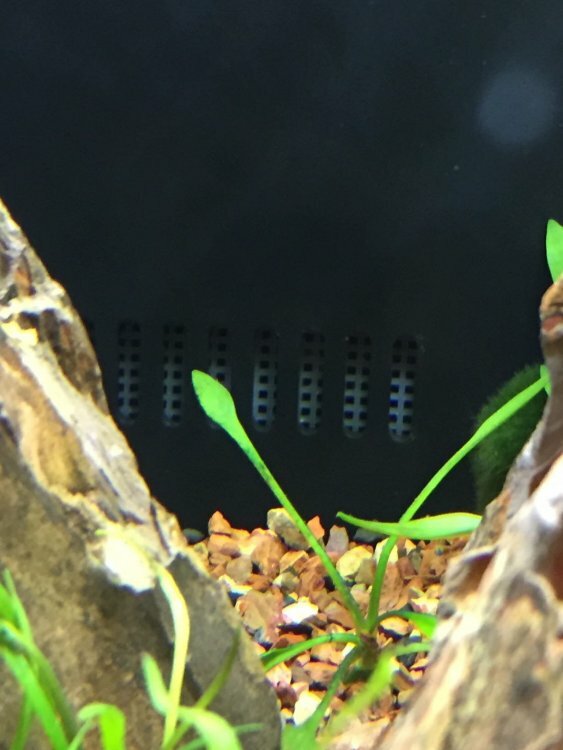 Not too sure what the mods are with the filter, I understand the inlet mesh etc but I have 2 sponge filters in each of my shrimp tanks and they don't worry about a bit of current so you may not need to bother adapting the outlet (if that was what you were planning) unless it is ridiculously strong. They are quite strong swimmers and sometimes I see them surfing in the current towards the filter? Sad to hear that about them. Hopefully, I have better luck. Maybe they have had some growing pains. It seems like their intentions are good. JayC was warninng that rock MAY alter the parameters but I think I would have left it in situ and kept an eye on it as you have, and I think that was what JayC was intimating as well. Correct, that is what I was alluding to. Rocks may impact water parameters depending on the type of rock. By the way, I e-mailed Aquatic Arts. They readily acknowledged that they had issues with ellobiopsidae and their shrimp supply chain. It sounds like issues that took a long time to deal with and involved a lot of education, being finally resolved about 6 months ago in part by changing suppliers. We shall see. I will be sure to post about my experience. I am optimistic after receiving details from them. Water parameters. 5:45PM, 28 Feb.
Not sure what is eating my Gh and Kh. Could it be that the tap reading I am getting for Gh and Kh is off? When I measured the TDS of my tap water, it came out as 45ppm, which doesn't seem to match with the Gh and Kh values. Perhaps this is confirmation that I just need to use RODI water... Ideas, anyone? I will keep my fingers crossed for you and look forward to hearing everything is fine at some later date. You don't need RODI, just RO is fine (plus carbon post filter), and the extra benefit is that you can drink the water too. Dipped in the TDS pen this morning. That's not terribly inconsistent, so I think the Gh/Kh readings I got from my tap water were off for some reason (something gassing off? ), so definitely going RO + remineralizer. I started a thread to ask what to use in the Water Parameters section. I've heard "ello" showing up easily 3-6 months after purchasing the shrimp from them. I've heard from someone else it showed up after 2 years of having shrimp - however, they didn't get their shrimp from AA. I hope that AA is right and they have a better supplier! That said, you still deal with the import issues... hopefully those are minimal. That part's on me for being naive and thinking "tank-bred" meant they were breeding them while I was making that decision. Having ordered, though, I feel committed. We'll see. If the experience is poor, I will have learned my lesson and actively seek out an American breeder. Here, by the way, is my solution to the problem of shrimp getting into the filter chamber. It is knitting mesh. I cut coarse foam to put behind it just where the intakes are - putting it the entire length seemed to slow down the flow too much. Hopefully, it will keep most shrimp out of there. So, I don't have my big RO jug yet, but playing around with adding minerals to my tap water I am at Gh-6, Kh-2, and TDS of 252. Does that mean there are a bunch of other solids in my tap water that aren't carbonates, calcium, or magnesium? The TDS looks high for those Gh and Kh readings, well, higher than I recall seeing for RO tanks with those specs. D﻿oes that mean there are a bunch of other solids in my tap water that aren't carbonates, calcium, or magnesium? Yes! There is going to be many things in tap water that are not necessary for a fish / shrimp tank. From my years of playing around with tap water, and from what I have read, and thats a lot, the only assumption I can come too is that you don't know what is in tapwater (TDS) and it can be changed by the water company/source without you knowing. I assume you read my tapwater thread where the TDS/parameterts were perfect with our tap water for Taiwan bees but they never survived, but by using the zerowater filter jug producing RO alternative water and remineralised water it has been plain sailing all the way since. I do use tapwater for the cherry shrimp and they are more adaptable (although I believe they would probably do better with remineralised RO water all the same, I posted a video on here that suggests that from a Pro) and survive without any problems. To summarise, your blues should be ok in tapwater, but as you don't know what is in the water then it is a risk from the start. If you use RO water and remineralise using a shrimp specific product then you KNOW that everything the shrimps need is in the water and will always be the same!